Review: 2014-11-08, Luke Rockhold vs Michael Bisping gets three stars thanks to a good finish (UFC Performance of the Night). The black belt in Bjj and former Strikeforce Mw champion Luke Rockhold entered this fight with a professional mma record of 12-2-0 (83% finishing rate) and he is ranked as the No.6 middleweight in the world (currently the #1 in this division is Chris Weidman); he suffered his last defeat in 2013 when he faced Vitor Belfort (4-stars-fight Belfort vs Rockhold) but he came back to win in 2014 beating Costas Philippou (=Rockhold vs Philippou) and Tim Boetsch (=Rockhold vs Boetsch). His opponent, Michael Bisping, has an official record of 25-6-0 (76% finishing rate) and he entered as the No.10 in the same weight class, he has fought twice in 2014 as well but he lost the first bout, against Tim Kennedy (=Bisping vs Kennedy); after that fight he beat Cung Le (=Bisping vs Le). 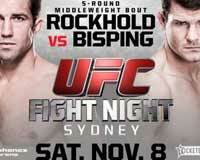 Rockhold vs Bisping is the main event of UFC Fight Night 55; they also faced each other a second time on June 4, 2016 (=Luke Rockhold vs Michael Bisping II). Watch the video and rate this fight!